Last week we had the amazing opportunity of co-hosting a nationwide trunk show for Land of Nod with our friend and Interior Designer, Kirsten of 6th Street Design School! Eight parties in eight other cities took place the very same evening, and we loved being able to participate and create our own party at The Awful Waffle. Land of Nod has treated us so well this last year and we were beyond grateful to work them in person this time! Would you care to see some of our photographer Lindsey Orton’s pictures of the night? Don’t be too sad if you missed it, the Land of Nod is offering Small Fry readers 15% off using “SFBLOG” from today until November 27th! To doll houses, everyone was so enthusiastic and made it so much fun! We got a head start on our Christmas shopping, and couldn’t pass up a spin in the old photobooth. Our photographer Lindsey Orton was as usual, a great sport for us! Also true to form, we found ourselves eating non-stop the whole evening. Whether it was waffles, or the most killer key lime sugar cookies from Cookie Haven, we were in heaven. 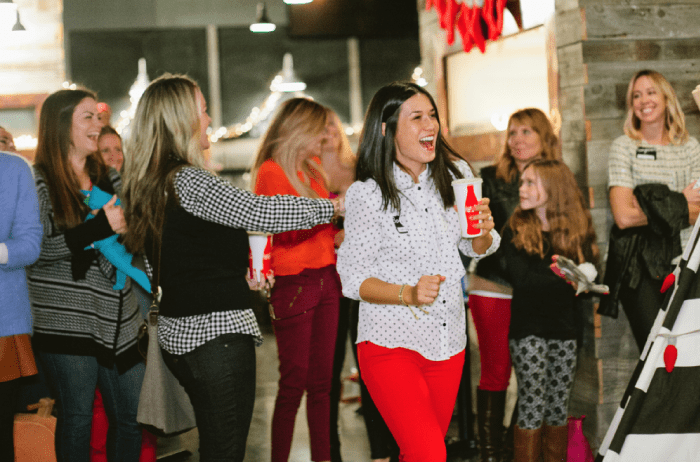 Thanks again to Land of Nod, Kirsten and all our awesome party contributors and guests! We’ve linked up with the other eight cities as well so you can see each unique party! Don’t forget to use “SFBLOG” on your next Land of Nod purchase for 15% off! Maybe by next Christmas we can convince Land of Nod to set up a permanent shop in Utah?! Attire: Keep reading for a list after the jump! San Francisco: Cristin Bisbee Priest of Simplified Bee & Michaela Warner of Michaela Noelle Design at The Makery. Black booties via Sole Society. This looked like so much fun…I loved following along on Instagram. Land of Nod’s starry night play tent is on my list of things to get this year. Thanks for the discount! This is so cute! I love this space. Lindsey Orton is amazing! She photographed my wedding 🙂 she is the best!